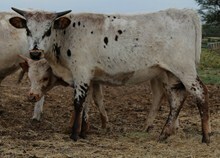 One of our few Roundup's Blue Spock daughter we have managed to hang onto. 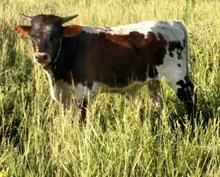 We now have a really nice solid red bull calf out of her and "Totem Pole" that calved on 7/30/14. Roundup/Ozark Mountain Queen/Overwhelmer/Phenomenon genetics here. Stacked pedigree that provides an excellent base for building. 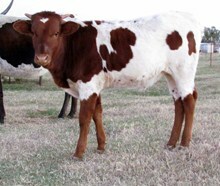 Has a very nice solid red bull calf by "Totem Pole" that has won 11 Bronzes. So far I'm seeing that this match with Totem Pole clicked. Time will tell.